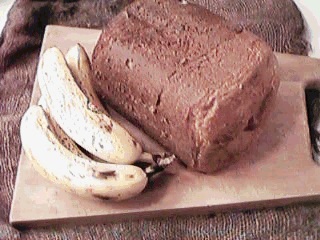 This is a yeast banana bread as opposed to the usual quick bread. It has a nice texture, a wonderful aroma while baking and remains moist for several days. When toasted, the aromas of the freshly bakingf bread are brought back to life. Even though the setting on the bread machine is for regular crust, the crust will be a dark, rich brown because of the banana, the fruit sugar and the brown sugar incorporated into the dough. Select two very ripe bananas. Peel and place in a bowl. Inspect while mashing with a fork. Discard any overly dark portions of the fruit. Place mashed bananas in the bread chamber. Add water, sugar, brown sugar, salt, butter and then bread flour. Place yeast and chopped nuts on top of the flour. Bake on regular bread, regular crust settings. Set your bread machine on delayed cycle and have toasted slices of this bread with your morning coffee.